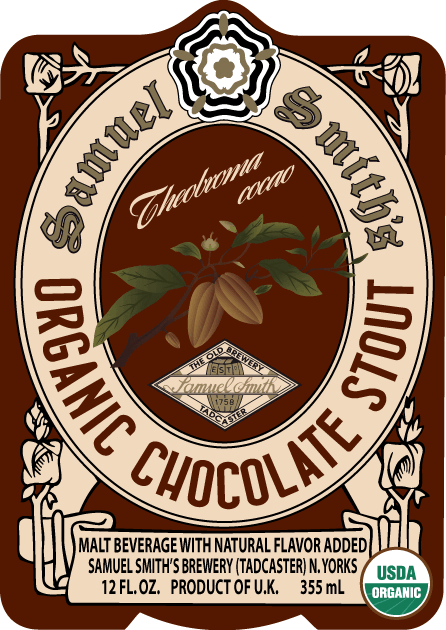 Seattle, WA – Merchant du Vin and Samuel Smith’s Brewery are proud to announce Samuel Smith’s Organic Chocolate Stout, a peerless blend of dark roasted malt and chocolate. It will be available fall 2012 coast-to-coast in 18.7 oz. (550 ml) bottles and in four-packs of 12 oz. bottles. Roasted barley and chocolate are beautifully melded together in this delicious stout: it’s a deep, rich, aromatic, and satisfying ale with full body and fruity notes from the Sam Smith’s yeast strain supporting lush chocolate aroma and flavour. Organic Chocolate Stout is fermented in open- topped stone vessels, slate “Yorkshire Squares.” It’s USDA Certified Organic by the UK Soil Association and – like all Smith beers – it is Registered Vegan. 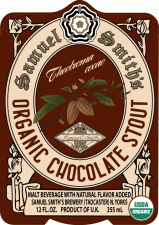 Samuel Smith’s, a small independent British brewery, has been making authentic beer in the village of Tadcaster, in Yorkshire, England, since 1758. Smith beers have been sold in the US since 1978. In addition to Samuel Smith’s, Merchant du Vin imports Traquair House from Scotland; Ayinger and Certified Organic Pinkus beers from Germany; Lindemans lambics, Green’s Gluten-Free beers and the Trappist beers of Orval, Westmalle, and Rochefort from Belgium; and Zatec from the Czech Republic.